I'm thrilled to introduce a new contributor to MommyMaestra. Latina mom and blogger, Marta Verdes Darby, knows a lot about homeschooling. She's been doing it for 10 years! And I am so happy to be able to include her stories and experience on this blog. Please welcome her... and enjoy her informative articles. Is there anything better than celebrating chocolate? A few years ago my son, Jonathan, was chosen to play Willy Wonka in his middle school production of Willy Wonka Jr. Because we were so busy with the business of memorizing lines, rehearsing, painting sets, and making costumes, I chose to create lessons based on the show. We began by first watching the 1971 film, Willy Wonka and the Chocolate Factory, starring Gene Wilder as Willy Wonka, and just treated it like we would any other form of literature. The world is astounded when Willy Wonka, for years a recluse in his factory, announces that five lucky people will be given a tour of the factory, shown all the secrets of his amazing candy, and one will win a lifetime supply of Wonka chocolate. Nobody wants the prize more than young Charlie, but as his family is so poor that buying even one bar of chocolate is a treat, buying enough bars to find one of the five golden tickets is unlikely in the extreme. But in Movieland, magic can happen. Charlie, along with four somewhat odious other children, get the chance of a lifetime and a tour of the factory. Along the way, mild disasters befall each of the odious children, but can Charlie beat the odds and grab the brass ring? 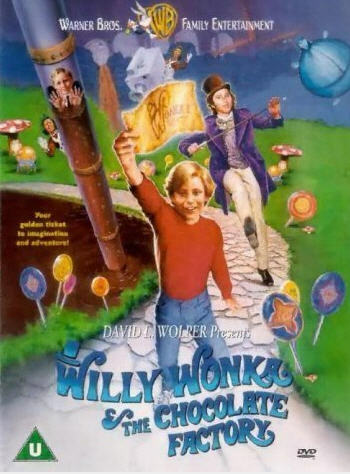 Besides Charlie, there are four other kids who find golden tickets, which win them the opportunity to enter into Willy Wonka’s Chocolate Factory. So we wrote a diary entry from each character based on what we knew about how they felt about finding the golden ticket, and then getting the opportunity to go into the factory. This exercise moved us through each character’s point of view. And let’s not forget the Oompa Loompa’s! We discussed a generally made up history for them and their plight. This, of course, is covered in Roald Dahl’s book, Charlie and the Chocolate Factory, but we were focusing on what information we got from just the film. Did you know the Chocolate River was made of real chocolate, water, and cream? It ended up getting very stinky fairly quickly. "We are the music-makers, and we are the dreamers of dreams," is from Arthur O'Shaughnessy's Ode, which also gave us the phrase, "movers and shakers." Wonka also quotes Shakespeare and Keats. My personal favorite, though, is "The suspense is terrible. I hope it will last," from Oscar Wilde’s The Importance of Being Earnest. Finally, we set up a Chocolate Bar - it works on two levels, get it? We lined up different types of chocolate bars and did a blind taste test. It turns out that Lindt chocolate was the winner by a long shot. Spending time in Willy Wonka’s magical world was quite a wonderful experience for us as a homeschooling family. Many of our dinner conversations were spent discussing what it would be like to live in a chocolate factory and how we’d run it. And of course, that’s the beauty of educating our kids at home: There’s no on-and-off switch for when learning happens. If you and your kids are interested in putting on your own performance of Willy Wonka Jr., check out this page on MTI Broadway Jr. Collection, which offers 30 and 60 minute shows for young performers. Marta Darby is an avid blogger, business owner, Cuban cook, graphic designer, scrapbooker, photographer and homemaker. She was born in Havana and left Cuba with her family when she was 5 years old. She likes to tell anecdotes and stories about her family (all 40 of them! ), her passions (dulce de leche and red lipstick), and eecially being Cuban. She is happily married to her fabulous gringo husband, Eric, and lives with him and their four children in a tiny house with a white picket fence. You can read more from Marta on her blog, My Big Fat Cuban Family. Incredible. I'd be beaming with pride, too. So happy I found you through TikiTiki, and Carrie's kindness in bringing me into the fold of BlogHermanas. I am meeting the most extraordinary women. Great post - I love Willy Wonka! And Ronald Dahl is one of my favorite childrens/YA authors. And love the video of your son! Mmmmmm...chocolate! I always crave it when I watch this movie!! Martha, love this video!! Thanks you for sharing with us your lesson plans, how fun! Nice, nice, I really enjoyed it. Love Willie Wonka, the plot is incredible. I love all the life lessons for children in this story. Marta, as always: I think you're a genius. Your kids must've thought you were the coolest mom/teacher for this lesson, too! Welcome, congrats and thanks for making your 1st post about one of my fave movies!!! How Do We Teach Our Kids About Oral Health?